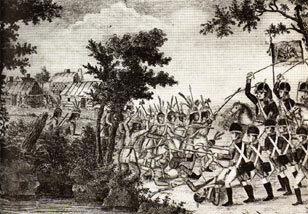 "Attack on a Creek village," period engraving of a battle in the Creek War (1813-14), original artist and source unknown. From The Creek War, an historical Web site by Carol Middleton. The overall devastation of the Creek War had a lasting effect on Osceola's people. Red Stick refugees -- Osceola and his mother among them -- fled south to Florida, where they joined the Seminoles. In Florida, the Red Sticks, who were also known as Mikasukis, became the leading militants within the Seminole confederacy.